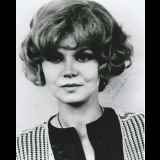 Barbara Harris is an American actress who was a Broadway stage star and later became a movie actress. She appeared in such movies as A Thousand Clowns, Plaza Suite, Nashville, Family Plot, Freaky Friday, Peggy Sue Got Married, and Grosse Pointe Blank. Harris has won a Tony Award and has been nominated for an Academy Award and received four Golden Globe Award nominations. New Response (Success): I sent Ms. Harris a letter, SASE, and 2 8x10s (1 c..